I'm a girl! I didn't know that when making this game, though. 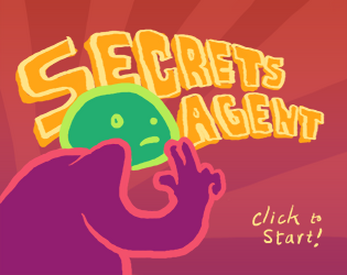 Secrets Agent was made pretty loosely and improvisationally. It's interesting for me to think about some of the influences on my thinking that affected aspects of it. This article about Street Wars by Leigh Alexander. In particular, the thematic limitations of classical game design's emphasis on perfectly logical/master-able (very simplified) systems. "Video games will always protect us from the truth: how smart we are not." This Embed With Nina Freeman by Cara Ellison. Thoughts about vignette games, personal storytelling, voice over. Porpentine's videos. I really really like these. Vocal communication feels to me like the most physical form of internet communication. Vocal improvisation is a nice way to feel out the cultural building blocks that affect you and the ways you want to subvert them? GameFAQs. Sometimes strangeness, sometimes intimacy, of being told how to beat a video game by a stranger. Jewel Chase. A really old "Microsoft Puzzle Collection" game that may have come with our computer? Inspired some of the premise and character design.